Where can I find old issues of Ottawa newspapers like the Citizen? The last time I wrote about how to find local papers in the Google News Archive, I had to explain it was like trying to climb Mount Everest. My great surprise when searching for the Google digital newspapers… I discovered it is now no longer a hidden gem ! If you’ve never looked for newspapers there you’ve got a treat coming ..
Great gathering! Thanks Reunion 2017 group! Well, John K and Sharon C were our resident O’Connor and Doyle experts and helped coach a cousin just starting her Doyle tree. We had two D’Aoust/Dow friends, Beth and Helen, stop by to share some info .. and contacts! .. for the Quyon-Onslow area. Cadieux ancestors from there were great friends with the D’Aoust families. Of course for Shaun, the highlight was Carol O sharing her discovery of a death certificate for ancestor John “Jake” McEwan .. and the story behind his disappearance from our family history! Sue S brought her flatbed scanner so we could scan photos for those attending. Nicole S helped us create a new Facebook group page that will facilitate sharing information in between reunions. A busy afternoon! Thanks to all who have helped out to pull together the many threads to make this happen. We are already working on our September 2018 event! 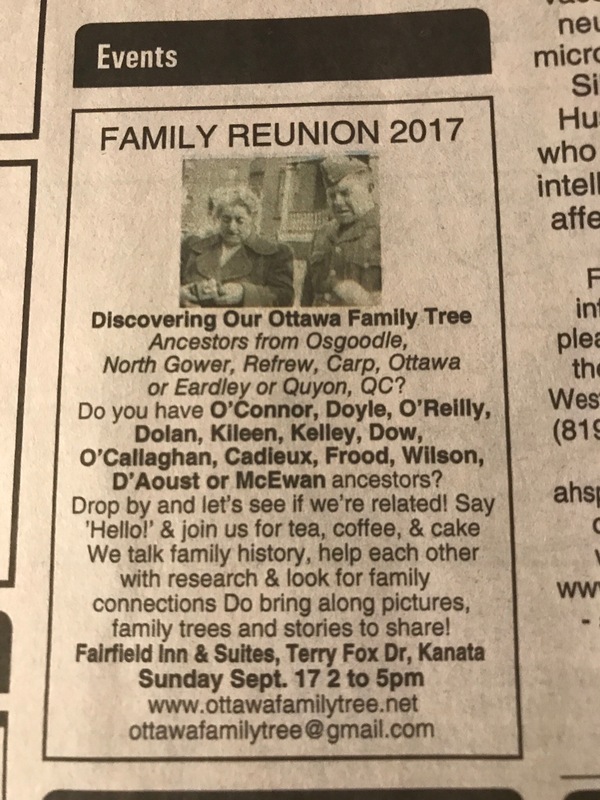 or join our new Ottawa Family Tree Facebook group! Did you see our ad in the Citizen today? Hope you’ll join us on Sunday and connect! If yiu can’t make it you can always email and keep in touch! The “world’s largest family history gathering without question,” according to organizers, got underway February 8, flooding the Salt Palace Convention Center in Salt Lake City with an estimated 12,000 attendees from 43 countries and nearly every state in the United States. Walking from my hotel around the corner, the streets — and the Family History Library! — were filled with participants sporting name badges and carrying conference portfolios. Now in its 7th year, RootsTech 2017 is the largest annual family history conference sponsored by FamilySearch International, the genealogy service operated by the Latter Day Saints’ Family History Department. General sessions of the 3 day event, which commenced Thursday with the opening keynote session, along with select workshops were being streamed live over the Internet to more than 100,000 viewers. Select events can still be viewed on www.rootstech.org the conference website. Though the event is past, you can still download the RootsTech 2017 app. Because you can scroll through the workshops and discover than most have handouts that are helpful and valuable, even if you can’t watch a video of the workshop and didn’t attend! 1. Share what you have found: Sharing with family members will perhaps encourage other family members to provide their own documents and information. This could help add missing details such as their parents, children and missing birth dates. 2. If you have an online family site, inviting relatives to your site will allow them to see the data and could encourage them to contribute missing information. All you would need is their name and email address. 3. For older family members who possibly do not have internet access, print out a family chart and visit with them about their relatives. This technique could also generate family stories and possibly provide new family photos to include in the family history. 4. Develop the habit of always backing up data regularly and storing the data in a different location in case of computer failure. 5. Pick one missing piece of information and focus on finding it; for example you might need the names of a paternal grandfather or trace additional generations of your surname. If you have a family tree on MyHeritage or use its Family Tree Builder software, the feature Smart Match alerts you when someone in your tree appears to match a person in another MyHeritage user tree. Be aware that the basic family site allows a limited amount of information and when reached, the website requires a yearly fee. MyHeritage also adds new data sets regularly to its collection and continually updates other data sets. For more information, go to its blog at blog.myheritage.com, then select the Historical Records category.